RANGOLI lays emphasis on identifying and nurturing the natural talent of its students and making learning a matter of sheer joy as a Pre School starts the process of the child’s initiation into the world of education. Since this is the first rung of the ladder that the child would progressively climb in life, it is essential that the curriculum is designed after taking into careful consideration the inputs from teachers and eminent educationists. We at RANGOLI have done just that and designed the courseware that has a sharp focus on various developmental areas like socio-emotional, creative, language, physical, cognitive, intellectual, moral and aesthetic development. RANGOLI follows E4 pedagogy. RANGOLI uses innovative methods to create a learning environment which helps a child to effectively utilize the pedagogy and achieve each and every milestone of learning and development. This is our methodology where teachers explain various concepts using their creativity, encourage children to explore things to have an experience of it and express their thoughts; which help teacher judge the learning outcome. 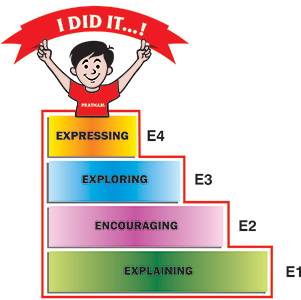 This 4 E are the steps which help a child to overcome and master every milestone of learning and development. Here teacher’s role is to explain and encourage the child and then child himself uses the environment created by the teacher to explore, experience and express the learning outcome.